A certified holistic health counselor who has studied with Andrew Weil, Deepak Chopra, and David Wolfe, Vanessa created Gnosis Chocolate in 2008 at the green age of 23 years old to help her clients experience the joy of conscious nutrition. 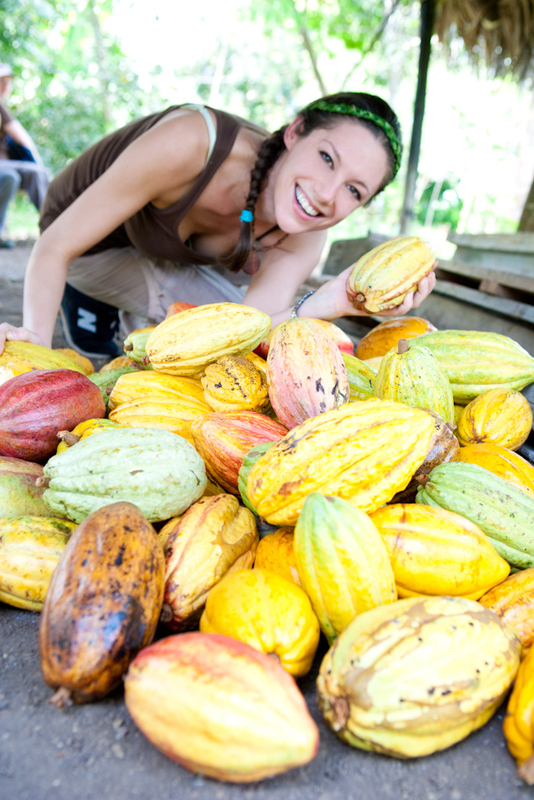 Raw chocolate is Vanessa’s vehicle for sharing her innovative expertise in nutrition, transformation, and conscious entrepreneurialism with the world. Vanessa and her company have been featured in many print and web publications (VegNews, Edible Queens, Health Magazine, Spirituality & Health Magazine, etc) on television and radio (NBC, Early Show, Martha Stewart, Sundance, Bloomberg’s NY Channel, etc.) and public speaking engagements (Institute for Integrative Nutrition, Health Freedom Expo, etc). to book an engagement or interview, contact her directly! The company Gnosis Chocolate has really turned into so much more than just a chocolate company. It’s turned a vehicle and platform for me to speak on all these different forms of Gnosis. So Gnosis Chocolate is what I’m using as an opportunity to fill packaging and website and speeches full of knowledge about health, wellbeing, spirituality, social and environmental consciousness, and conscious commerce. Let me tell you a little bit about my background, if you are interested! For the last 7 years I have been interested in health and have been on a path to becoming a doctor. Initially, I was on track to medical school, but when I underwent a personal health revolution, I realized that food was the best medicine. I began studying herbs and nutrition on my own and became a Certified Nurse’s aide and personal chef. Instead of continuing my premed studies I enrolled at the Institute for Integrative Nutrition. That’s where I developed my health counseling skills and passion for healing. I had never expected to make a product, it all came as a surprise. I also always loved to cook. My mom is Italian and taught me that when you feed someone, you nourish them with your love - and that was deeply engrained in my idea of food. I made chocolate for the first time during the last weekend of the Institute for Integrative Nutrition. It was the same weekend David Wolfe (world authority on raw cacao) came to speak. I brought some of the bars to school to share with my peers and they went crazy! Why did I choose to make raw chocolate instead of conventional, roasted chocolate? Well, because raw anything is closer to nature, so it’s less processed - there’s less “stuff” added to it. It has gone through less machines which alone leaves less chances for contamination! Also the neurotransmitters, enzymes and antioxidants are much stronger and at higher levels in raw vs cooked chocolate. I also promote raw chocolate because the raw food movement is a movement toward eco-sustainability and health. And that’s why every single ingredient I use is raw. Because not only is the food itself healthier because it’s raw but also because raw food production is much more environmentally friendly. It’s much more loving and in touch with nature. So the movement itself is something I want to support. When I graduated I started making the chocolates as a gift for my clients. They started asking to buy the chocolate for friends, coworkers and family members. One day a store in Brooklyn called me out of the blue and asked to carry my product. I thought the only product I had to sell was my health counseling lectures! I didn’t have packaging or labeling. I made the labels in Word overnight and delivered some chocolate - but I didn’t realize that I was starting a company! I never planned on being a vendor or anything of the sort! It’s grown through people asking me to make more chocolate - not me sitting down making a concept for it and writing a business plan and getting investors, etc. Because of this, it’s been really easy for me to put who I am as a health counselor and healer into the product. The bars are totally representative of me. So its grown like that. I don’t do any sales or marketing except for chocolate parties and events that involve and give back to the community. I don’t make sales calls - almost every store that sells Gnosis Chocolate hears about us through word of mouth and seeks us out! What does my day look like? In recent days I’ve been spending a lot of time on updating the website, answering customer service calls and emails, our upcoming Organic Certification. I also spend about an hour a day working on projects for other people - I really see what I am doing as a way to help others grow as well. I spend a LOT of time on sourcing. I source from all over the world, from importers who are as close to the farm as possible. The most beautiful part for me is the ability to chose who I support. I really believe voting with your dollar is the only way to change our society in commerce. We can always choose support the companies that are conscious - it just takes a little digging. To make a product from these conscious companies is one of the most powerful tools that owning Gnosis Chocolate has given me. The biggest challenge for me, being a 24 year old, is that I’ve never managed a company. There are so many things you want to do for your employees but you also have to think about productivity. There is an important balance between productivity and having fun. I want my employees to be really happy, healthy and not overwork themselves. Two of my employees started their own businesses while working at Gnosis. Thats one of the most exciting things I like to cultivate. My vision for Gnosis is quite large, I must admit. And I’m still developing it, but I know that it’s not just going to be Chocolate. I don’t know if it’s going to be Gnosis Foods. I have lots of ideas for a whole line of food and people who are excited to jump on that. Maybe it will become Gnosis Events and I’ll host events all over the country and the world where I go and speak and host other amazing speakers (oh wait, we already started doing that! :). Maybe it’ll be Gnosis Center for Holistic Health or Gnosis School for Conscious Commerce… Getting the community together is a platform to reach more people at once. Chocolate is a key that opens so many doors to peoples heart, so this is a great place to start!!! In making decisions, your intuition comes first. Listening to my gut is the only thing thats enabled me to have this company! Get input from people but ultimately do what feels right to you so you can stand behind your decisions. Do your best to have a really happy team. You don’t want people who don’t believe in what you are doing. While I’m still small, I buy fresh organic veggies for my employees and feed them superfoods and spring water, and coconut water, and CHOCOLATE! so they stay healthy and happy. Get community support. Rather then putting money into advertising, I like to locate Gnosis’ funds towards the community by giving as much as I can to organizations I believe in, helping small companies startup that are in alignment with what I do, and throwing events and parties. Infusing the abundance back into the community not only raises my morale but also gets community support. That goes so much further then money spent on marketing because you earn the space on the supermarket shelf, rather then buying it. If every company went through word of mouth we would have a very different society. If you put all your efforts into the best possible product people will promote it for you. The reason the stores carry Gnosis Chocolate is because somebody in the community walked into the store and asked the buyer to carry our chocolate. That is straight proof that putting effort, love and gratitude into the community is the way to run a successful business. In efforts to affect many more people than those around me, I donate 10% of all profits of my Health Counseling Practice to the Physician’s Committee for Responsible Medicine, and 10% of all profits from Gnosis Chocolate to The Fruit Tree Planting Foundation. In doing business with us, you are not only helping yourself to better health and prosperity, but are helping millions of others to do so.